He began his 45 year broadcast career as a News Reporter, Producer and Anchor at television stations in Alabama and Florida. In 1963, he produced and anchored the nation’s first nightly 1-hour newscast at Tampa’s WTVT-TV. From 1963 to 1966 he organized the first local news department of WCBS-TV, New York. He was General Manager of WVTV, Milwaukee, 1969-81, establishing it as a top independent television station. From 1981-87 he was Vice President and General Manager, first of KWGN-TV, Denver, and then WGN-TV, Chicago. He was Director of Radio & TV for the Catholic Archdioceses of Chicago from 1987-1999. 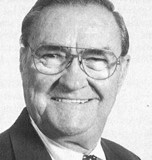 He served his industry well as Vice President of the National Association of Independent Television Stations and as a member of the Wisconsin Broadcasters Association Board of Directors from 1972-79, where he served as Vice President for Television from 1977-79, and as President of the WBA in 1979. Joe Loughlin passed away on Nov. 9, 2017.